When you’re hungry, you tend to focus more on your stomach and less on your work. Skipping breakfast will make you feel hungry sooner. If your children are allowed to snack in school, snacking gives the bacteria in your mouth more opportunities to feed and attack. If snacking is not an option, children will be so hungry at lunchtime that they choose the first food item they see—whether it’s healthy or not. A nutritious morning meal, however, will help keep children full enough so they can make healthier food choices. It’s not just about eating in the morning—it’s about eating the right thing. Although this week is National School Breakfast Week, try to prepare a nutritious meal for your child at home instead. Cafeteria and vending machine foods are not always the healthiest choices and may not provide your child with the necessary nutrients. In addition, many families rely on quick cereal in the morning because they’re rushed for time. Many cereals are filled with sugar, and studies show that cold breakfasts don’t keep you full as long. 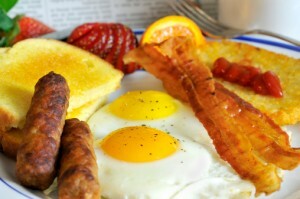 Instead, try creating a homemade breakfast platter with eggs, sausage, bacon, toast, pancakes, oatmeal, or fresh fruit. You should also make sure your children brush their teeth before heading off to school. Children miss about 51 million hours of school each year due to dental problems and treatments. Dr. Ganjoor can keep your child’s smile healthy for life. Contact Celina Family Dentistry at (214) 851-0130 to request an appointment. We welcome patients from Celina, Prosper, Gunter, Frisco, Anna, Pilot Point, McKinney, and surrounding communities.